Fellow Wiltshire side Calne Town come to Weymouth Street, Warminster, tomorrow evening (Wednesday 14th February 2018) making it yet another important game for Warminster Town FC (the Red and Blacks). With fourteen games to play and a very difficult run in, every point is going to be vital. 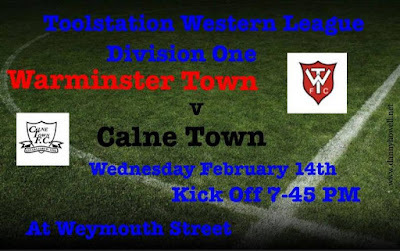 Calne are currently four places and ten points above Warminster in the table. Let’s hope it’s a happy Valentine's night for the home side. Kick-off is at 7.45 p.m.